If you are one of the people who choose not to use an app such as Newsstand or Currents to get all of the world’s news on your mobile device, then you will be delighted to hear that Google is launching a massive update for its mobile news reader. The current reader looks like a much older Google product, but the new version is sure to remind everyone of Android’s design language. And yes, there’s a hotdog/hambuger menu to use. The overall look gives off a Google Now-like card vibe, and you can even choose to use a light or dark theme; whichever your eyes prefer. There is a simplified navigation menu, easier integration with Google Feedback, and a ton of other features. You can view all of the highlights below. Ability to customize the webapp to suit your taste by changing the theme from light to dark, the font size and opting for a larger “story card” with more information per story at your fingertips (from the Settings menu, at top right). A weather gadget in the Local section. The popular “Editors Picks” option. Social posts from Google + related to the story are included in the article cluster. 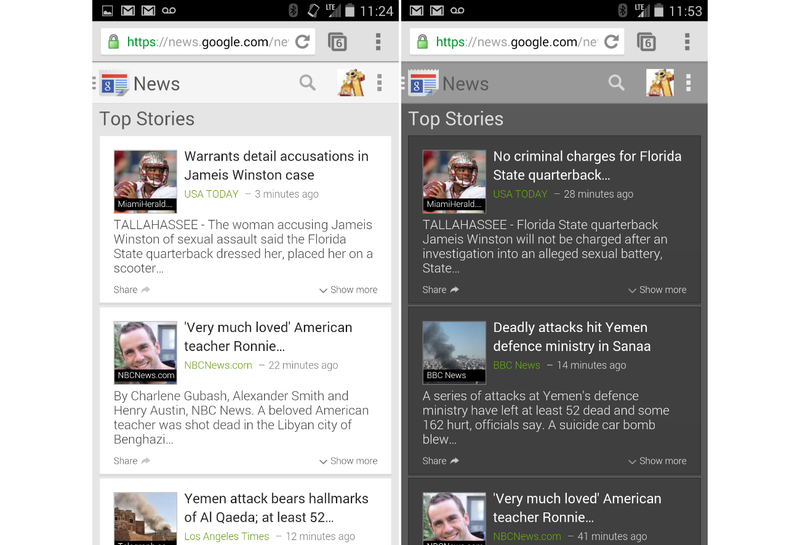 Once the update is live, you can check out the new look at news.google.com from your mobile browser.